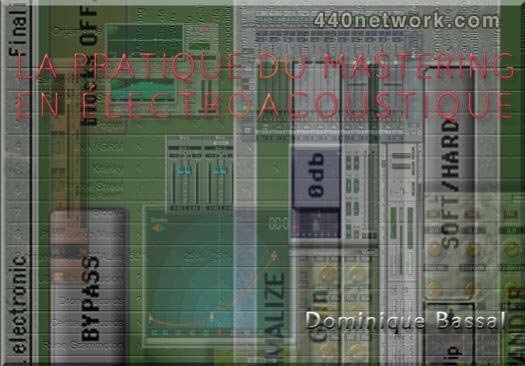 Dominique Bassal's article "The Practice of Mastering in Electroacoustic Music". Second part : "Means, Functions and Underlying Logic"
- to demonstrate basic reasons justifying the use of mastering, once past the objections based on abusive or spectacular theoretical positions. - the almost near complete absence of devices that can detect or measure these recalcitrant signals. In recording studios, which require a broader diversity of equipment, these particular systems are not as valued. In terms of acoustic design, for instance, recording facilities require the setting of multiple, well-insulated specialized spaces adapted to specific sound sources (drums, voice, piano, etc.). A mastering studio, on the other hand, will instead concentrate its resources strictly on the design of a neutral acoustic space in the control room. - maintain an optimal gain level throughout the signal path. - be able to quickly determine the overall balance of levels and timbres, before listening fatigue sets in. Again, one would hardly consider these abilities to be in any way useful to a mastering engineer. In fact, the numerous technical contingencies inherent to the work of the sound engineer and the mixing engineer tend to distract them from the vigilance that should be given to the overall characteristics of the sound stream. This vigilance therefore becomes the responsibility of the mastering engineer. He must above all demonstrate a sustained attention through time, so as to locate the subtlest problems. The mastering engineer must in addition be able to quantify these problems, be they a problematic frequency or an amplitude contour to control. He must also possess a long-term acoustic memory, so as to remain coherent with the type of audio profile commonly used in the particular musical style. As we can see, all these qualities can only be developed as part of a very precise mental configuration, based on the ability to crystallize in practice a specialized and highly controlled listening. These objective factors- material and human- combine to lead to the following situation: the overall sound (listening/monitoring) quality in mastering studios is always necessarily a couple of steps ahead of recording studios. The mastering engineer is in a position that allows him not only to perceive, but even to foresee or anticipate problems ranging from the most subtle features to the most general frequency characteristics, which were either simply unnoticed or impossible to hear for recording engineers and mixers. For example: a mixing engineer who hears a -6dB dip centered around 80Hz will react by systematically adding a few dB at 80Hz to the channels that have signals in these frequencies. He could also, on the contrary, decide to completely "clean" this frequency portion through radical filtering, since it does not seem to contain a strong signal. - he also hears errors due to acoustic habits developed during a project and which tend to affect judgment through a progressive habituation. It is very difficult for those involved in a project to avoid or detect such habits. For example: the sound engineer may record the first tracks of a project with slight excess in high frequencies. Throughout the following tracks, he will tend to continuously add brilliance to the sound, while being less and less aware of doing so, to maintain cohesion. Later, the engineer may eventually become alerted by signs of auditory fatigue, and start to systematically filter out the problematic frequencies. - the mastering engineer will also compare the predicted result with his knowledge of similar products, not for plagiarism purposes – which is in fact extremely difficult to accomplish – but in an attempt to push the product towards the limits he knows to be possible to obtain in the specific sonic style. With time, some mastering engineers may even develop more impressive listening abilities. They can know for instance the strengths and weaknesses of main studios and engineers they commonly deal with. They also become able to anticipate the impact of specific sound compressors and enhancers of such or such broadcasters on their work. This ability gave rise notably to the radio mix, dance mix and other types of pressing optimized for very specific channels of distribution. The high costs involved in this type of refinement confined it to commercial production, which then totally succumbed to the level wars. This eventually led to a standardization of optimization processes, followed by a similar standardization of the processes of audio treatment of broadcasters, which soon made specialized pressings obsolete. At the heart of the mastering studio is the small-sized console. The analog version is most often homemade (a single supplier, Manley, manufactures them to order only), and until recently combined almost every signal processing module. These modules (Neumann, Telefunken, etc), plug-in boards with controls on their front side, are designed specifically for mastering studios: their notched controls allow exact repetition, if needed, of any signal processing treatments. - de-essers, more transparent and efficient than their "studio" equivalents. Even if they are not as necessary as with vinyl cutting, they nevertheless remain the only available tool to control sibilants. - special effect devices, more commonly encountered in the era of the dance mix, but still used now and then. Finally, mastering equipment also includes a whole set of playback / recording devices in every format: magnetic (Studer, Ampex, Tim de Paravicini), 16 and 24 bit DAT (Panasonic, Sony, Tascam, etc), multitrack cassette (in Adat formats: Fostex, Alesis, etc. and Hi8 : Sony, Tascam, etc) and magneto-optical master recorders (Genex, Otari, Akaï, Studer, etc). We may also mention a variety of A-D and D-A converters, dither noise generators and sampling frequency converters (Weiss, Prism, dCS, Pacific Microsonics, Apogee, etc), as well as all the equipment necessary for the transfer to media accepted by manufacturers, as we already mentioned. - obtain a diversity of other results less easily reducible to a literary description, but which are definitively part of the common aural experience of a majority of music consumers. - making sure, on a general level, that the listening experience will be a coherent and pleasant one. The mastering engineer will not hesitate, for instance, to modify the equalization of a piece that may appear correct on its own, but that does not "fit" in the whole frequency profile of the product. The same may apply to the overall perceived volume and the acoustic space. As in any collective artistic enterprise, the recording of a musical project represents an emotional investment that is often exhausting. Some musicians, for instance, have a conception of the sound they wish to give to their instrument that can sometimes be quite… emphatic. If it prevails, this conception will quickly create problems of acoustic interaction with the next elements to be recorded. Inevitably, negotiations are then necessary, extra-musical considerations become prevalent, and errors in judgment build up. The sound engineer becomes at this stage saturated by the intensity of the experience, made stronger through dozens of repeated listenings of each piece. We then resort for mixing to a second engineer totally foreign to the project, specifically to take advantage of his fresh perspective on the whole. Moving to another studio is also a judicious choice: different tools, different acoustics, different possibilities. But mixing is also a very difficult and equally random operation. Whoever has had a chance to listen to a large sample of non-mastered mixes knows the amazing variety of bizarre and incongruous sounds that can be encountered. Why, or better, in what sense are these sounds bizarre and incongruous? Because they have been distorted by one or several successive faulty monitoring systems and squeezed through acoustic habits that are real vicious circles, these sounds are very far from the original artistic project as first conceived by its creators. In fact, they correspond to the will of no one: they are a non-human product, only consumable "as is" by connoisseurs of artistic vacuity, who once had to make do with an arsenal of expressive incompetence limited to out-of-tune instruments, skipped notes, toneless voices, erratic rhythms, non-existent arrangements and infantile harmonizations. However, as far as the artistic contents of a project worth being faithfully reproduced are concerned, mastering remains in the logic of pertinence of this outside perspective. Taking over from the sound engineer, whose resources are exhausted, the mixing engineer looks for the combination of settings that will best communicate the proper energy of the recorded tracks. Next in turn, with "fresh ears", the mastering engineer will immediately perceive acoustic nuisances that prevent a general equilibrium, and his job is to clean the final product from these imperfections. When we add to this the specificity of the tasks to accomplish, the specialization of the tools and the skills necessary to accomplish them, it becomes clear why mastering is considered as critical a step as recording, mixing and manufacturing. As we can see, there is no correspondence, no common point between the frequency fluctuations of these loudspeakers, and therefore one cannot design a palliative measure that could be applied to every one of them. A mastering engineer who would equalize in a way to compensate for the curve of a particular model would simultaneously aggravate problems of another model, or even of the same product placed in a different environment, as shown by the two curves of the loudspeaker D.
- headphones, even when they are of high-quality, come with their own problems. Since they operate on a very different acoustic mode than loudspeakers, they cannot guarantee any reliable transfer, especially in terms of stereo space. They also do not solve the problem of ultra-low frequencies, and their typical level of use, 110dB, can be harmful to the ear. Anyone exposed for more than half an hour a day to such a level risks permanent hearing loss. - special curves: instead of having to "verify" each mix in a consumer's situation, it seemed more practical to try to reproduce an average environment using an equalization curve applied directly to main monitors. A painful essay-error process aimed at designing such a curve has only brought arguable ameliorations in a very limited number of cases, and clear drawbacks in every other situation. This represents another stinging defeat, evidently because of the basic principle, but also because of the disadvantages related to the use of equalized monitors: phase problems, unstable global response, slowness of transients, etc. - a studio design using diffusion (1), which claims to fulfill three objectives: it considerably extends the sweet-spot, it uses wall reflections to naturally correct weaknesses of loudspeakers, and it is closer to the level of reverberation prevailing in the average listening room. This ambitious acoustic conception turns out to be extremely complex to accomplish. Only the first objective is clearly fulfilled. Wall reflections rarely consent to exhibit the proper characteristics, and the large variety of conditions of reverberation remains resistant to any schematization. (1) Contrary to focalization, the common practice that consists in pointing the loudspeakers towards a central point, to minimize acoustic intervention from the room, diffusion tries to use reflections by placing the loudspeakers in parallel with lateral walls. The only effective mastering must be made based on a flat listening (1), which is itself possible only in a correctly designed room, acoustically treated and perfectly insulated. A very high-quality amplification system must be used, producing at least 1000 watts per channel, and connected to true reference loudspeakers. A system of acoustic response analysis handled by a professional acoustician must then be used to visualize the final performance and make appropriate corrections. (1)In the actual conditions, "flat" still involves a final difference of 2-3 dB in the frequency response curve at listening. This remains a possible source of errors in optimization. The primary optimization work, aimed at the consumer level experience, must be based exclusively on information collected through this uncompromised listening, free of any mental compensation and any preventive modification. The secondary versions, used for other channels of distribution, are then derived from this initial version, and possess restrictions whose pertinence can only be guaranteed by a long-term experience. - "Each system imposes its own errors, cancelling most of the corrections made to the product!". 4. once mastered, this product is pleasant in every system except for the ones that have a problem at 200 Hz. But this problem already appears in every product that the owners of these systems listen to: therefore they will not attribute the fault to this particular product. There is a second exception, although ironic: on the system that has been used for mixing, the mastered version will sound less pleasant… and the mixing engineer, if he is inexperienced, may deduce from this that the mastering engineer is incompetent!!! - there will always be systems - or at the very least frequency regions - in which its action will be nil or even negative.